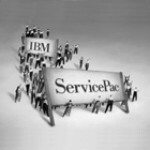 - ServicePacs provide a convenient, affordable way for businesses of all sizes to access a wide range of information technology maintenance options and support services available from IBM. - With ServicePacs, customers can purchase high-quality defined services that are designed to meet their priorities, requirements and budgets. Each one offers a fixed term, fixed price service solution, which can be ordered and bought at the same time as the corresponding system is purchased. - Each ServicePac is identified by a part number and is linked to specific machine types and models. Check the catalogue, or ask your Business Partner, for ServicePacs that are appropriate for your purchased machine.